Mystery illnesses plague millions of people. Researchers found a link between the childhood kissing disease mono and these unexplained illnesses. ALPHARETTA, Ga. -- Kelly Deushane's dining room table is piled high with books, most touting beneficial, healing diets. There are manila folders filled with medical files. Those folders sit alongside stacks of meticulously detailed scrapbooks. To page through them is to see a young woman, driven to become a television journalist. Headshots from her TV career give way to photos of her with her young husband. Later scrapbooks capture the typical life of an American family -- replete with trips to Disney World and fun times at home. Kelly is the wife of 11Alive General Manager John Deushane. 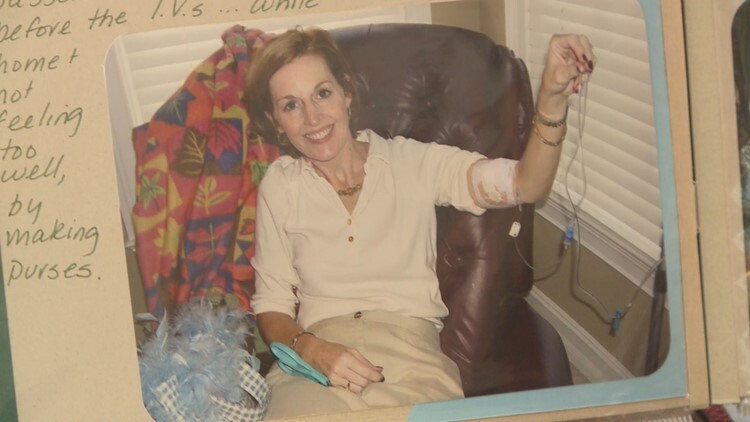 But a closer look at one page featuring a smiling Kelly shows an IV coming out of her arm. It's one of the few signs to an outsider that hint at a life filled with a struggle, a constant battle to be well. "I just didn't want to be the whiner, the person who didn't want to do anything ever, the person who needs so much sleep, the person who has the odd diet. You just feel high maintenance." Kelly was the one who got sick on every family vacation, the one who suffered through years of sinus problems that required surgery, only to wind up with a serious infection of her sinus bone. Among her many illnesses were digestive and bladder issues, a false diagnosis of Scleroderma, and a diagnosis of Celiac disease. She caught the mild head colds her two daughters brought home from school, but for Kelly they were intense and prolonged. "Anything anyone ever brought home I would always get it harder and longer. You start feeling like a hypochondriac because you have all these weird things happening that you can't really point to and no one can see." No place was safe. One day she pricked her finger on one of her rose bushes. She got "something called Rose Gardener's Disease which required two surgeries and months of therapy and my finger still only goes like this," she says, holding up her hand to display a finger that will no longer straighten. She spends part of her day helping to care for her seven month old grandbaby, Elsie Kate, whose entrance to daycare was delayed to help protect her grandmother from germs. Over three decades, Kelly has seen countless doctors for each seemingly disconnected illness. It was just this year that she read about mono, how for some people it can come back, wrecking their health. She thought she recovered from it. "Never in a hundred years did I ever think all of this was connected back to mono." But earlier this year she read about Epstein Barr, the mono virus, and how it can come back and affect health in a myriad of ways. She asked her functional medicine doctor to do the blood test for mono. She was stunned by the results. "The typical levels of a dormant Epstein Barr Virus is 0 to 20, and here I was over 600. So clearly this virus had been thriving and surviving for over 30 years in my body." Kelly and her doctor consulted with Doctor Henry H. Balfour Jr. at the University of Minnesota. Balfour is one of the foremost world experts on mono and is leading a team that has developed a mono vaccine that could be used in human trials as early as next year. "Epstein Barr Virus, the cause of mono, was discovered in 1964 and yet here we are many decades later without a vaccine, and I think the reason for that is that people do not appreciate first of all how significant mono can be." Balfour says 280,000 college freshman contract mono every year, one out of every four students. The average amount of missed school is three weeks, so where some may see an unwanted but unavoidable passage to adulthood, Balfour sees not just a single illness, but the possibility of long term, life changing complications. "Epstein Barr Virus is responsible for a number of chronic conditions, especially certain forms of cancer and autoimmune disease and even multiple sclerosis. Everybody with MS essentially has been infected with EBV. Ninety to 95 percent of the world's population is infected with this virus and so right there, not considering cancers and MS, we would have a huge problem solver. Espstein Barr Virus is definitely involved in multiple sclerosis, in several forms of cancer such as Hodgkins disease and in auto immune diseases other than MS such as lupus, or even rheumatoid arthritis." For people like Kelly Deushane, it's too late for a preventative vaccine, but at the advice of Dr. Balfour, she began a course of antiviral medication. The results were life changing. "I'm not so tired and the biggest non substantiated thing I can say is I have kept a pace since this spring that I haven't kept in 10 to 15 years and I have not gotten sick. It's revolutionary. I usually catch every virus in a 20 mile radius." Balfour says some of the symptoms people with recurrent mono could experience are, “signs and symptoms that we associate with auto immunity such as ringing in the ears, joint pain, fatigue, almost an influenza like picture, but instead of getting over it, you don't." He also says mono could play a role in certain misunderstood illnesses. "It's pretty clear that the virus EBV, the cause of mono, is not the only cause of chronic fatigue or fibromyalgia, but it certainly could be one of the causes." 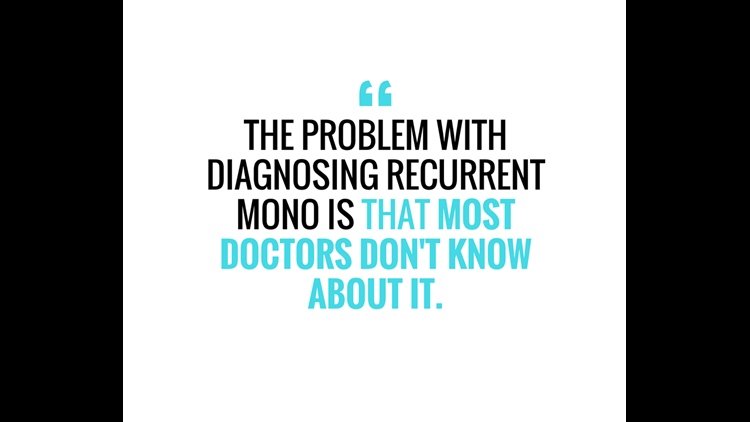 The problem with diagnosing recurrent mono is that most doctors don't know about it. Kelly has been hesitant to recommend that friends get tested, because of her own exhausting medical experience. "You go on the internet to find anything about it, there's nothing, absolutely nothing. In fact I've told my internist and two others that I have chronic Epstein Barr and they do the nodding smile and glaze over. They have no idea what I'm talking about." For Kelly, the antivirals have been life changing, but they don't work for everyone and there is no official treatment. Balfour continues the final push on the vaccine, with hope that another vaccine can be created to treat those already infected with EBV. "I think that this virus and its potential complications has flown under the radar for a long time which is unfortunate because 90 to 95 percent of the world's population have been infected by this virus by the time they're adults, so clearly there's a large portion of us who have chronic symptoms that could well be due to EBV and I think it's time to pay more attention to the virus." Kelly Deushane never quit fighting, even when her body tried to make it so that she could no longer fight. "This is all just part of a puzzle that needed to be put together and unfortunately the way most doctors and medical professionals work is that it's never a whole picture -- one doctor for every part and unless you're your own detective you're never going to figure out why this seemingly odd and unconnected stuff happens in one person." The truth was within Kelly all these years, a truth Doctor Balfour is trying to unlock so that chronically ill people can regain their health. Editor's note: In reaction to the huge response to this story, 11Alive hosted a Facebook Live chat with expert Dr. Henry Balfour, reporter Jaye Watson, and mono patient Kelly Deushane. You can click here to watch it on 11Alive's Facebook page, or you can watch it below.